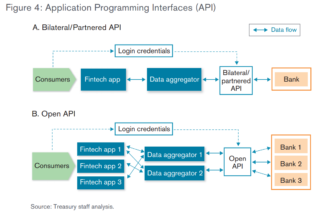 The U.S. Department of the Treasury’s recent report evaluating economic opportunities presented by nonbank financial institution and fintech company innovations includes a detailed account of current data aggregation activities in the financial services marketplace and provides policy recommendations that shed light on the federal government’s current views on data aggregation. (See our legal alert and blog posts (here and here) for a discussion of other portions of the Treasury’s report.) In seeking to harness the potential benefits that can come from data aggregation, the Treasury report firmly supports the inclusion of these market participants. Following are key takeaways from the Treasury’s report with respect to data aggregation practices and regulatory issues. BCFP and private sector should develop consumer disclosure best practices. The Treasury suggests that the Bureau of Consumer Financial Protection (BCFP) should develop, either with the private sector or pursuant to its rulemaking authority, consumer-facing disclosures that are “plain language, readily accessible, readable through the preferred device used by consumers to access services… so that consumers can give informed and affirmative consent regarding to whom they are granting access, what data is being accessed and shared, and for what purpose,” and to opt-out of such sharing. Clarifying applicability of third-party oversight guidance to data aggregators. The report states that there is some ambiguity regarding when third-party oversight guidance issued by federal banking regulators applies to data aggregator relationships, noting that data aggregators entering into “an API agreement with a bank  may become subject to third-party guidance because of the contractual relationship, which can increase compliance costs.” The Treasury suggests that federal banking regulators take action to resolve this ambiguity. Data security addressed by GLBA Safeguards Rule. The report assumes that “data aggregators and consumer fintech application providers are subject to the Gramm-Leach-Bliley Act (GLBA)” and that “the Safeguards Rule appropriately addresses” data security concerns with data aggregation activities. To the extent additional regulatory or legislative measures are considered to address data aggregation data security issues, the Treasury suggests that such activities occur at the federal level rather than the state level to ensure uniformity. Other financial regulators should support data aggregation. The report suggests that regulators in addition to the BCFP should take steps to enhance data aggregation activities, including the Securities and Exchange Commission, the Financial Industry Regulatory Authority, Department of Labor, and state insurance regulators.